Church Missions: A Sermon Preached before the Society for the Advancement of Christianity in Pennsylvania, on Epiphany Night, A.D. 1851. Philadelphia: King & Baird, 1851. The Healing of the Nations: A Sermon, preached in St. Peter's Church, Albany, on Thanksgiving Day, Nov. 29, 1855. The Great-Hearted Shepherd. 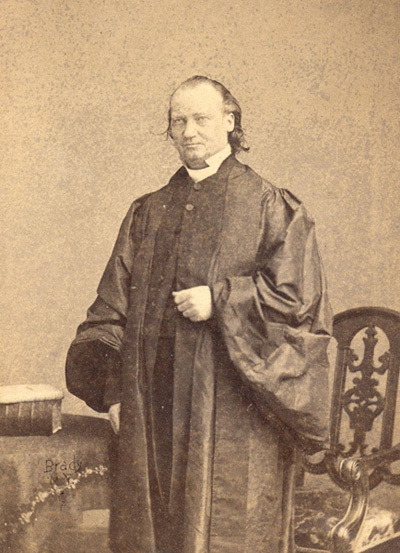 The Sermon in Memory of the Right Reverend George Washington Doane, D.D., LL. D., Late Bishop of the Diocese of New-Jersey. New York: Pudney and Russell, 1859. A Church History of the First Three Centuries, from the Thirtieth to the Three Hundred and Twenty-third Year of the Christian Era. The Spiritual Point-of-view: or, The Glass Reversed: An Answer to Bishop Colenso. Palmoni, Or, The Numerals of Scripture, a Proof of Inspiration: A Free Inquiry. Who Was James, the Lord's Brother? New York: Pott and Amery, 1868. Morgan Dix writes: "[This text] was written by the Revd Milo Mahan D.D., when accused of holding false doctrine on the subject of Confession, by the Right Revd. Wm. R. Whittingham D.D., Bishop of Maryland. It constitutes his justification of himself under that charge. It was never published, because the Bishop of Maryland withdrew the charge, and Dr. Mahan was elected Professor of Systematic Divinity in the General Theological Seminary, June 30. 1870, notwithstanding the slurs & insinuations which he refers to in this MSS., & which had cost him the place at that time." Memoir of the Rev. Milo Mahan, D.D. By John Henry Hopkins, D.D. From volume three of The Collected Works of the Late Milo Mahan, D.D. New York: Pott, Young and Co., 1875. The Exercise of Faith: A Book for Doubters. Edited by John Henry Hopkins.